I hope you are having a great start to April! It's been pretty chilly here the past week with no sign of spring yet...darn! I am really looking forward to summer this year. 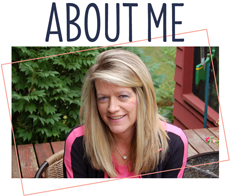 My little granddaughters are at such a fun age for going to park, going to the lake, carnivals, fairs....all those fun summer events, can't wait! 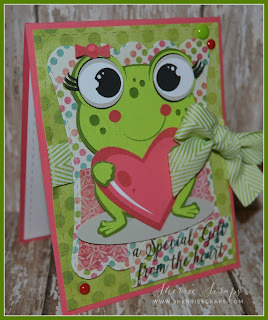 I have a cute card to share today using a cute file from Miss Kate Cuttables called~Love Frog Girl. 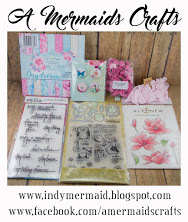 The base layer is Jaded Blossom Card Mat Dies followed by the Scallop Slider and Topper Die. I layered this adorable froggy with foam tape for added dimension. The sentiment is stamped with the Special Packaging stamp set. The papers are from MME~Oh la la collection and the ribbon from my stash. I also made a fun little treat to go along with this card. I created a belly band which was 1 1/2 x 8 and then layered the next layers using the Card Mat Dies. The butterfly is created with the Spring Dies 2. This is so super adorable!!!! 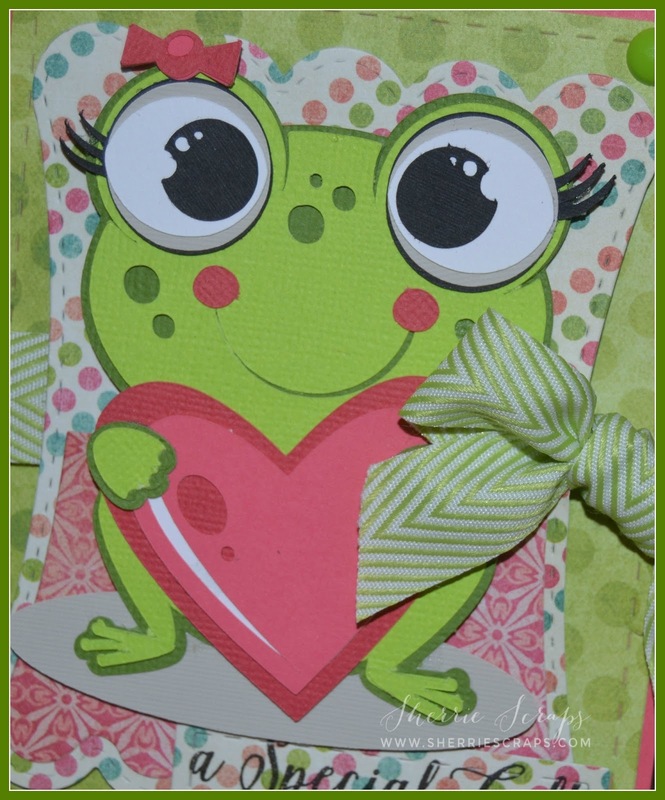 Love that cutie frog! Such a sweet froggie! Love the eyes! Love the pinks and greens too! Miss Froggie is adorbs! Love the colors! This is so sweet. I love the frog with the big eyes!! ps we are going to have 85 degrees on Wednesday-- sorry. hope you warm up soon. Too cute!!! I just love those eyelashes! 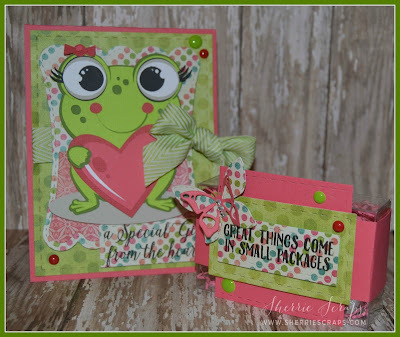 Such fun papers too, and just perfect with your adorable little frog! We've still got snow here, with more on the way. I feel your pain!! Adorable project! Love that sweet frog and those gorgeous papers you used! The color combination is one of my favorites! What a Adorable card and fabulous!! 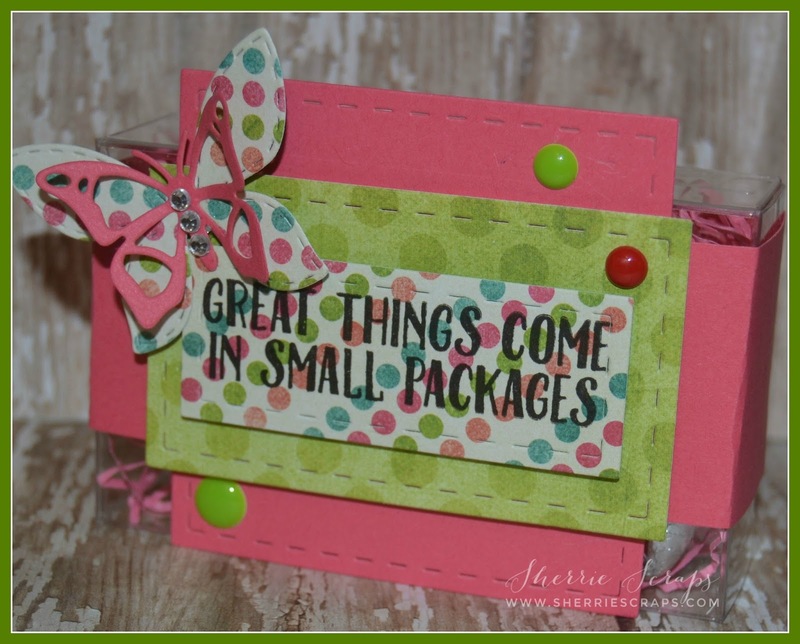 Love that sweet little frog and the pretty butterfly!! Have a great day. Oh my goodness, this is the cutest thing ever! What an amazing card, certain to brighten someone's day! When I was little I loved to go to the Sanrio shop and buy Kerokerokeropi the frog! LOL! Well I hope it warms up for you super quick! I mean it's April already! Someone needs to send that Memo to Mother Nature! :) Your Frog is ADORABLE! Super CUTE card and sweet treat! Pretty Butterfly too! Have a great day! 80 degrees...Oh man, you lucky! It was 28 and snowing today :( I am so ready for spring! That froggy is so very cute and I love the bow!! Soooooooooooo cute! 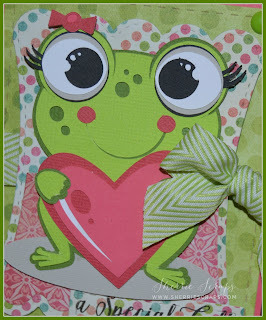 LOVING that frog, the colors and the heart!!!!!!!!!!!!!!!!!!!!! Oh my! She's adorable!! I love her huge eyes and lashes! Great papers! Sherrie this set is absolutely adorable and beautiful ! I adore the froggy !! Okay this is just the cutest!! Love it! It just doesn't get any cuter than this adorable little frog! She is absolutely adorable...those eyelashes!! Love the fun prints and fabulous bow you used. 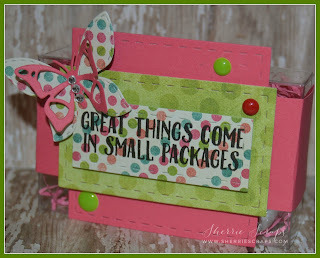 And, that little treat box is the icing on the cake! This froggie is just WAY too cute!! Love the cute eye lashes and pretty ribbon! OMG this set is too darn cute. Love the colors and cute frog. The ribbon really adds to the card. Love it. 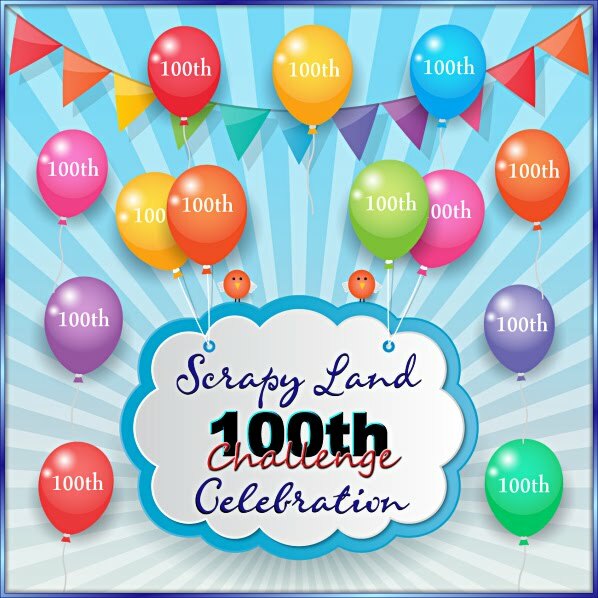 So sorry in being so late to visit have had a very busy week. Playing catch up today. Haha...this little froggie just made me laugh! What a great creation! 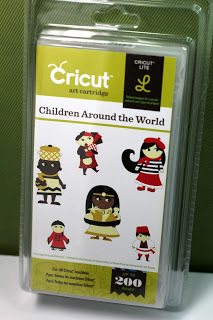 Thank you for sharing with us at Silhouette Challenges Monthly Showcase.